Our goal is to make your child’s first dental experience a positive one. Whether it’s a simple checkup or restorative care, Smiles Dentistry for Kids provides comprehensive gentle dental care in a comfortable and welcoming environment. We treat your family like our family! We strive to provide excellent dental care and make all of your child’s dental experiences comfortable and fun.Whether it’s a simple checkup or restorative care, we provide high quality comprehensive dental care through patience, understanding and compassion. We create great smiles and trusting relationships. Dr. Matthew Hillman and his friendly team take their time with each patient and never rush through visits. If your child needs extra attention or time to adjust to a new atmosphere, he or she will get it. We use easy-to-understand terminology to eliminate confusion when your child visits us. 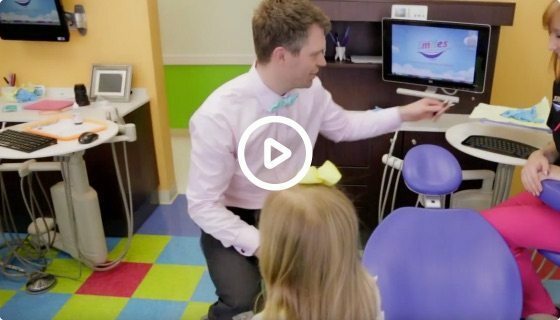 We want to make sure your child knows there is nothing to fear when going to the dentist. A trip to the dentist can be fun! Our office is brightly colored with movies, cartoons, video games and a super friendly team that loves to work with children.